Last year three of us decided to climb the Half Dome Cables. We trained and then went online to capture our permits – first come, first get. We watched the webcam and saw the snow slowly melt, too slow to install the cables – no cables, no climb. But we decided to hike anyway just to see a record water flow; we wanted to experience everything … but the cables. During that 12-hour hike, we stopped at every sight. After catching our breath from the altitude and the beauty, we took pictures of waterfalls, rocks, rainbows, valleys. We travelled together, encouraging each other to continue, sharing our thoughts as comrades. All this togetherness enriched our experience. This year, with a lighter snowfall, the cables were installed on scheduled. Our luck held, permits from the Lottery arrived and our group swelled to five. On hike day, as sunrise removed the evening we set boot to trail. Within 5 minutes the group split, taller Half Dome hikers with longer strides pulled away. 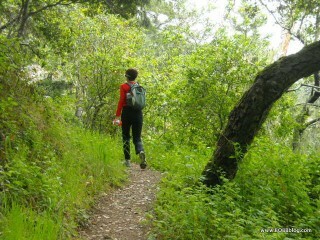 Then my quicker pace had me increasing the distance from the other short-hiker. Now, I was alone. 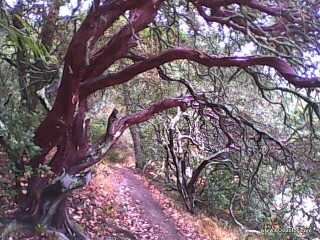 I was hiking the same trail as last year, but with only one set of eyes – mine, and this made it a different path. If asked, I would say I’d never been there. Last year, Vernal Fall was a fire-hose pounding my black-plastic-garbage-bag poncho. I knew there were 600 steps carved into the granite cliffside, but I could only ‘see’ them with my feet as I clung to the wet stonewall. But this year, there was only a modest spray and I could see the steepness and the uneveness and the majesty of each step. That 2,000-foot climb is rewarded by the flat, hot, and sandy Little Yosemite Valley. Previously the Merced River roared, drowning all sound. Now, I could hear birds and I thought I could even hear a squirrel rolling a pinecone. As I continued, the solitude allowed my mind to see oddities. In a wide sandy trail why are all the pinecones resting exactly in the middle? Why do people stay on the sandy path instead of hiking on the firmly packed game trail that runs along side? And, on and on my mind wandered. When alone in the forest there’s no sense of time. 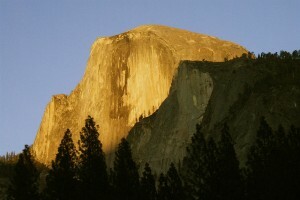 One minute I’m blinking my eyes to wake-up and the next I’m blinking because Half Dome just materialized. Five hours had passed, but no fatigue just excitement. The goal of this hike was before me; it was time to climb the 45-degree incline of the massive granite slope called Half Dome, and not alone, I had the seed of memories . . . and my camera.